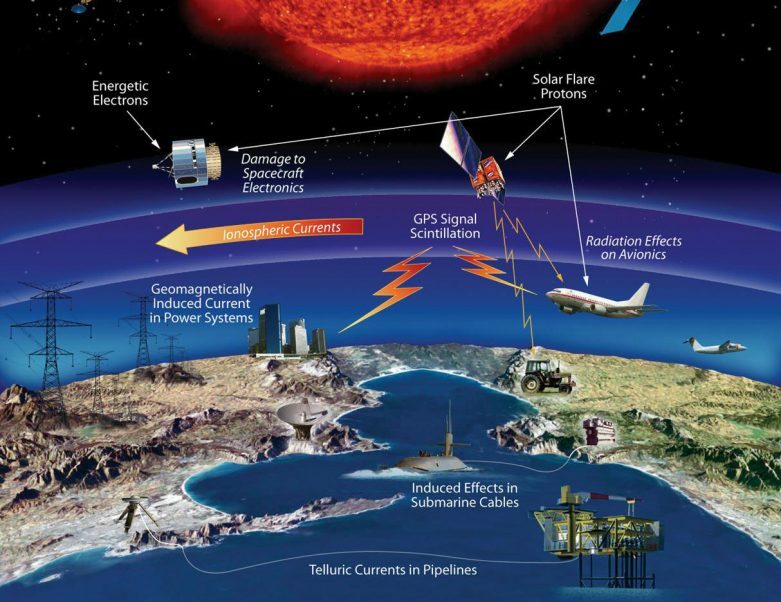 How Do Solar Storms Affect Our Health? Weather forecasts sometimes feature mysterious solar storms, and the term sounds kind of scary. Some people, especially those who suffer from hypertension, can feel there is something like this happening on the Sun surface even without somebody telling them, as they don’t feel well in such periods. What are these storms? In what way do they affect our health? Let’s find it out. Actually, it’s not the solar storms, of flares, that appear to affect health, but the geomagnetic storms caused by them. The term solar flare denotes an explosion in the atmosphere of the Sun, which leads to temporary disturbance of the magnetosphere of the Earth. The interaction of the Earth’s magnetic field and solar winds has an impact on power grids, satellites, and other objects using electricity, which can result in electrical blackouts. Sounds scary? It’s not – solar flares occur often, and the geomagnetic storms caused by them are usually not that powerful; large storms occur very rarely. However, there are people who react to such space events even without knowing about them. Do solar storms affect our health? That’s a tough question, as there is not enough evidence to support the theory that such storms really do affect our health. For example, NASA claims that as far as health is concerned, solar storms are harmless, because they never pass the atmosphere of the Earth. However, it is true only of the radiation that reaches the Earth; it’s the fluctuations in magnetic fields that do appear to affect human beings. Also, experience of many a patient with hypertension suggests there is something that does affect us. Experience of ordinary people is not to be neglected, and researchers have long been trying to find out whether there is something behind it, or it’s just wishful thinking. Here is what they have found. According to the results of a study conducted by an international team of researchers in 2014, there is an association between the frequency of strokes and geomagnetic conditions on particular days. The scientists analyzed over 11,000 reports from hospitals and found that on days when geomagnetic storms were detected the overall risk of stroke was increased by 19%, and in those aged 65 or older, the risk was even higher; it was increased by 27%. Although the study results are limited, as there were factors that were not taken into account, such as cardiovascular diseases, the findings suggest that geomagnetic storms could affect blood pressure, circadian rhythms, heart rate, and some other parameters that can contribute to an increase in stroke risk. Besides, there is evidence suggesting geomagnetic storms can disrupt circadian rhythms and elicit a stress response, which manifests itself in anxiety, and loss of sleep. There is still a lot of research that needs to be done in order to find out whether fluctuations in magnetic fields can affect us. According to Gary D., a professor at NJIT’s Center for Solar-Terrestrial Research, the changes in magnetic field are insignificant and cannot have an impact on health, because they equal about 0.1% of the magnetic field which makes compasses work. The bottom line is that those who feel they are affected by geomagnetic storms should pay attention to weather forecasts, as many of them feature information on whether there are storms that are going to reach the Earth, and make sure they have an opportunity to have a rest and take medicines that help control blood pressure.